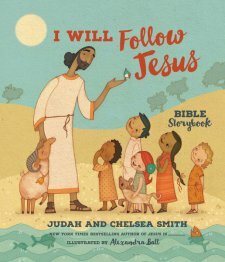 "I will Follow Jesus" is a bible storybook for kids aged 4-8. It has a presentation page if you would like to gift this book for a special occasion. This Bible storybook goes through many major stories in the Old and New Testament. I like how this Bible focuses on different people and tells their stories. Some key people this Bible discusses includes: Moses, Hannah, Ruth, Daniel, Esther, Women at the well, Philip, Paul, and many more! I enjoyed reading the letter to parents to hear Judah and Chelsea Smith's heart on creating this Bible. 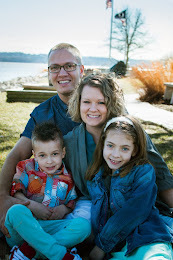 They said, " Our desire is to translate the gospel for children in a way that they can grasp, to help them grow in their faith from a young age, and to inspire them to follow this Jesus for the rest of their lives." My heart agrees with that statement 100%. It doesn't take very long to read each story and the pictures are very sweet and use calm colors. 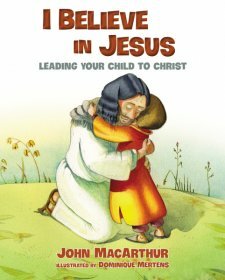 My 4 year old and 8 year old seem to be really enjoying this bible storybook because it really is easy for them to connect to their creator. So our family absolutely recommends this book! This bible also has scriptures scattered to read throughout each story. I think that hearing some of the stories that my kids have heard numerous times already but hearing it apply differently to their life is giving them a new God perspective on things! It is drawing them in more! Thanks Booklook program for sending me this book free of charge in exchange for an honest review. I was not paid for this review and all opinions are 100% mine.